To upload your image to Amazon EC2, you need to ensure that your image is in the raw format. You can do that by create the image in the raw format to start with, or you can covert it at a later time. For example, to convert a Virtual Box Image to a raw format, you can run the following command. We compress the image to avoid uploading a bunch of zero-ed disk. My image is 8 GB uncompressed and 334 MB compressed. We create a standard Amazon instance, upload the image. We then attach an EBS volume the appropriate size for our image. We then extract the new image onto the EBS volume. Detach the image and create a snapshot. We then register our image with a user provider kernel. See Custom Kernel Docs. Working with Amazon EC2 Images, it has been helpful to build custom images, so they match the same images that are installed in customer environments. I also find it help to be able to run the same Operating System that is running in dev and production environments. CentOS and several other Linux Operating system will work with the default Kernel. Building a custom image is pretty easy to do, but there are a few things you need to do to get your system to work on Amazon EC2 instances. Here are the steps we took to build this image. 5) I wanted to keep SELinux running on the system, and I found that I needed to restore some linux contexts to the files the cloud-init was creating on boot. This allows the SSH keys to work with cloud-init, and we get to keep SELinux on. 6) We get rid of any existing keys in the environment so the image can be shared with others. Using the temperature monitor in the Incubator, I’ve run into a problem. The problem is that the temperature seems to be fluctuating more than I’ve expected. Since we haven’t noticed any problems with the other thermometers, I’m going to assume that the problem is with my code. Perhaps it has something to do with my oversampling code? Do I need to average the samples better? Well, let us take a look at some data. 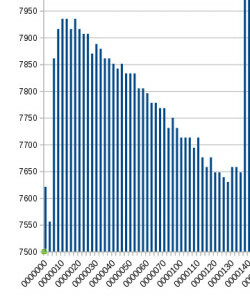 Lets first look at the offending data here. As you can see, it looks like the data is forming a wave. Is this something cause by the incubator itself. Perhaps noise on the ADC line? Lets look at some more data. 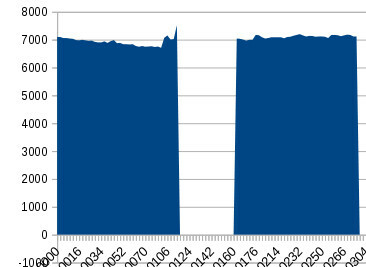 This is what the data looks like when the temperature logger is sitting around the house. Notice how it is missing the wave effect. The following is roughly another 9 days with recording data at fifteen minute intervals. 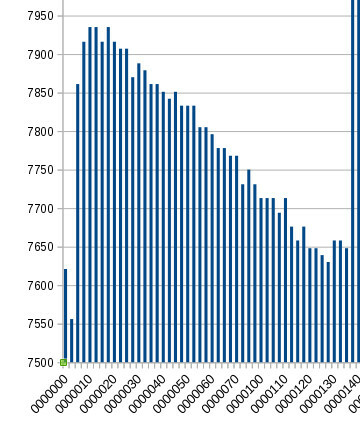 Notice how we still have the wave going on through out the data. Well, after a lot of logging, it seems that we still have a problem. Now I decided, lets record more data, but let us record extra data points. So now instead of just storing the over sampled value, we will also store the average of the over sampled value, the non over sampled value, and the average of non over sampled value. The averages will be from four sequential readings. Here are the results from storing them once every fifteen minutes(so far all the temperature recordings have been taken at 15 minute intervals in hopes of storing an entire incubation period worth of data). This new set of data seems to rule out problems with the oversampling; however, it does show that using averaging appears to provide some better results. This still leaves the question, are we still just getting ADC noise? To rule out getting a group of bad readings, let us try recording the temperature every minute and see what that looks like. This appears to rule out getting noise on the ADC line; however, it does leave a few questions unresolved. Why do the other thermometers not report the same type of behavior? Is this just an problem of observing the analog thermometers at the right time? Is this a sensitivity issue? Perhaps the MSP430 calibration is off? When running the data logger, I found that I ended up with a big hole in the data that I’ve been storing to flash. The program is supposed to find the next available memory location for writing. I’ve come up with two possible theories as to the failure. 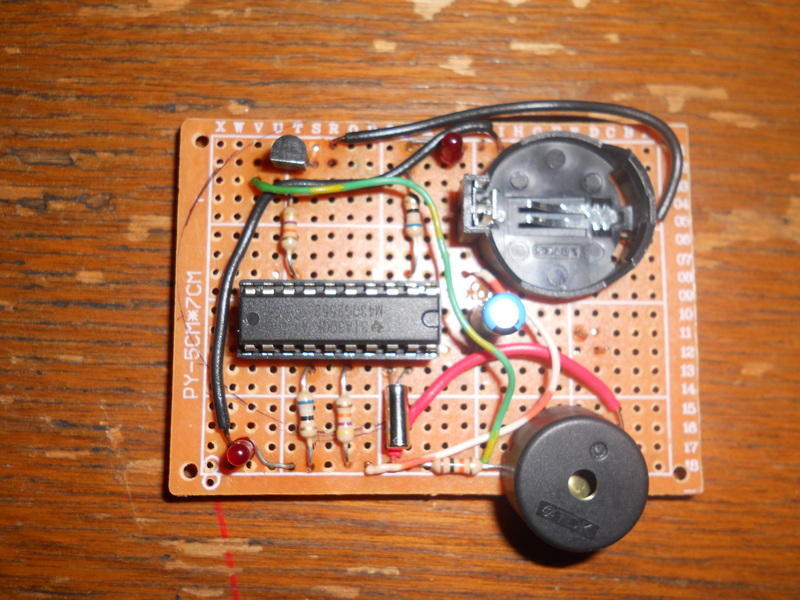 The first idea is that the MSP430 is under powered when attempting to write to flash. 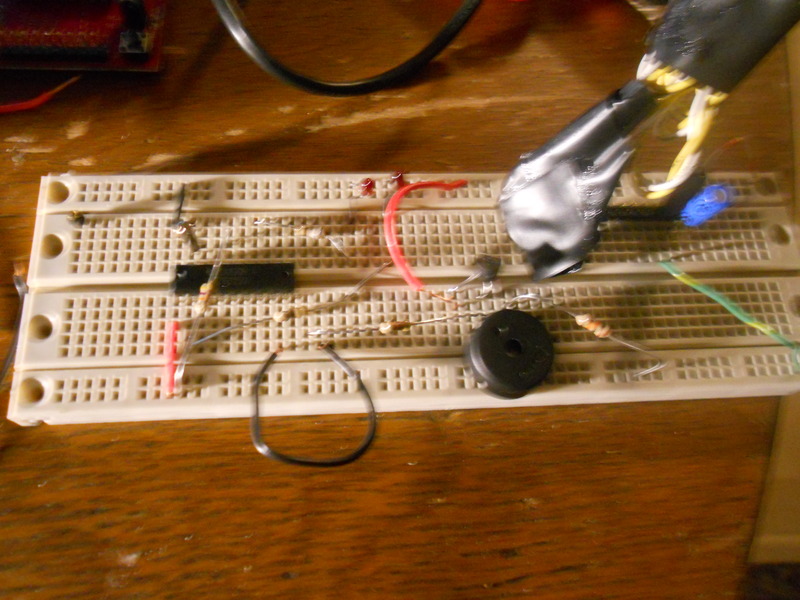 The second idea is that the oscillator has not yet stabilized when writing to flash. Using a voltmeter, I was able to determine that the MSP430 battery voltage was running low when this data was being collected; but why the hole in the data? This could be temperature related. As the temperature drops in the household, this would cause the battery voltage to drop as well. Is that enough to cause the hole? I’m not sure. 1) Move the logging event to occur later, as this may allow for the oscillator to stabilize before attempting to write to flash. 2) Ensure that the battery has the proper voltage. This could be done by checking battery voltage manually, or making the MSP430 use the built-in ADC to monitor the battery. 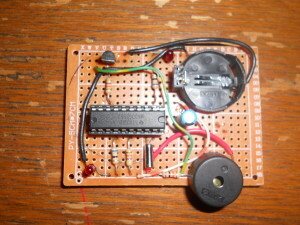 I’ve improved the prototype and moved the project from the breadboard to a prototyping PCB Board. Here are the pictures in the different stages of development. The code for the project is available at GitHub. My family has started incubating eggs, and it has been a real struggle to keep the temperature in the right range. Perhaps it is the incubator, perhaps user error. At any rate, I wanted to lend a hand with my technical know how, so I have begun working on a project. 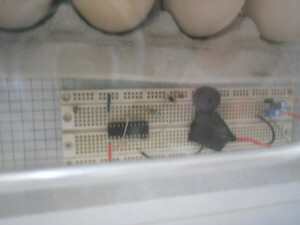 The basic concept is that I want to create a temperature logger to store data for the entire period of incubation, and also an alarm or buzzer for when the temperature is out of bounds. 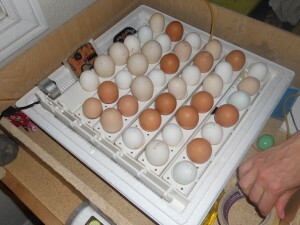 Here are the results for three days of incubating. The temperature is in F multiplied by 100. Basically 98.00 degrees equals 9800. For the project I’m using the MSP430 with factory calibrated temperatures. The ADC in the MSP430 is a 10 bit ADC, but is only sensitive to about 0.5 degrees C. To increase the sensitivity, I’m using oversampling to get about 13 bits of accuracy. I then use Integer math to convert the temp to F with two decimal places. I check the temperature every 10 seconds and alarm if the temp is to high or too low. Right now the data logger is storing temperature at about 15 minute intervals. I need to add a crystal so that I can measure this more precisely, as the times right now are approximate. The buzzer / alarm is proving a bit problematic for me. Right now, I have a 70 dB buzzer, but it seems to quiet. The other problem I have is battery life. I’m currently using one or two CR2032s( http://en.wikipedia.org/wiki/CR2032_battery ). When I’m using one battery should last two or maybe three incubations. When I’m using two batteries I need to regulate the voltage, but the current voltage regulator I’m using uses too much power, so battery life is estimated to be roughly 30 hours. 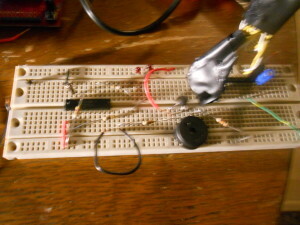 The two battery approach may be needed to keep the buzzer well powered. I’m looking at a new LDO voltage regulator, and that should take care of the problem. 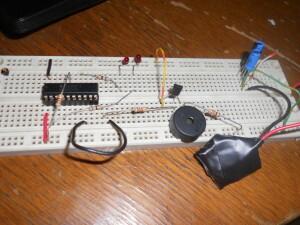 I’ll put some pictures up of my temperature logger as I progress. Right now it is in the prototype stages on a breadboard. Today, I needed to boot off a CD, but not the whole CD, as my CD Drive in this computer is unreliable. I can’t boot off a floppy, cause I can write to a floppy on any computer except this one. I also can’t boot off of a USB stick because the BIOS is too old. What to do? This worked for me! I needed to get Java working in browser in linux. After installing Java, it never seemed to work in my browser in CentOS. After doing some searching I found this article that explains how to install the plugin manually. I hope this helps someone else!